Australian Ravens are black with white eyes in adults. The feathers on the throat (hackles) are longer than in other species, and a bird tends to extend these when calling, while holding its head and body in a horizontal position. Australian Ravens are usually seen in pairs. Another aid to identification of this species is the absence of wing-flicking while calling. Young birds resemble the adults, but have dark eyes, shorter throat hackles and often the presence of a pink, fleshy gape. This species is sometimes called a crow. There are six members of the family found in Australia: five native breeding species and one infrequent self-introduction. Three are called crows and three ravens, although there is really little difference. Most Australian species are similar in size and colouration, and can be difficult to tell apart. In some cases, identification is aided by the separate ranges of different species, but differences in plumage, habits and calls offer good clues for distinguishing them. The bases of the feathers of the crows are white, while those of the ravens are grey, although this is only useful if birds are held in the hand or if discarded feathers are found. The Australian Raven is found in eastern, southern and central Australia. The Australian Raven is found in all habitat types, with the exception of the more arid areas of Western Australia. 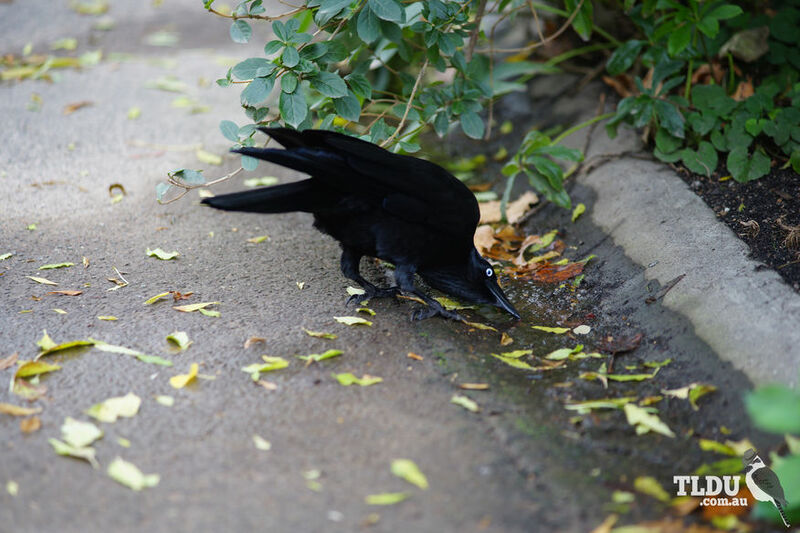 The Family Corvidae has a wide-ranging diet that may consist of grains, fruits, insects, small animals, eggs, refuse and carrion; however, the Australian Raven is mainly carnivorous. Australian Ravens construct a large untidy nest, normally consisting of bowl or platform of sticks, lined with grasses, bark and feathers. Both sexes construct the nest and feed the young. The incubation of the eggs is performed solely by the female, and only one brood is raised in a year.